QAD Inc. is a leading provider of enterprise software and services for global multi-national manufacturing companies. QAD provides best in class ERP and related solutions, on premise and in the cloud, for manufacturers in the automotive, life sciences, consumer product, food and beverage, high technology and industrial product industries. With operations in 19 countries, QAD serves more than 4,000 manufacturing sites in over 80 countries. QAD’s mission is to help every customer become an Effective Enterprise. 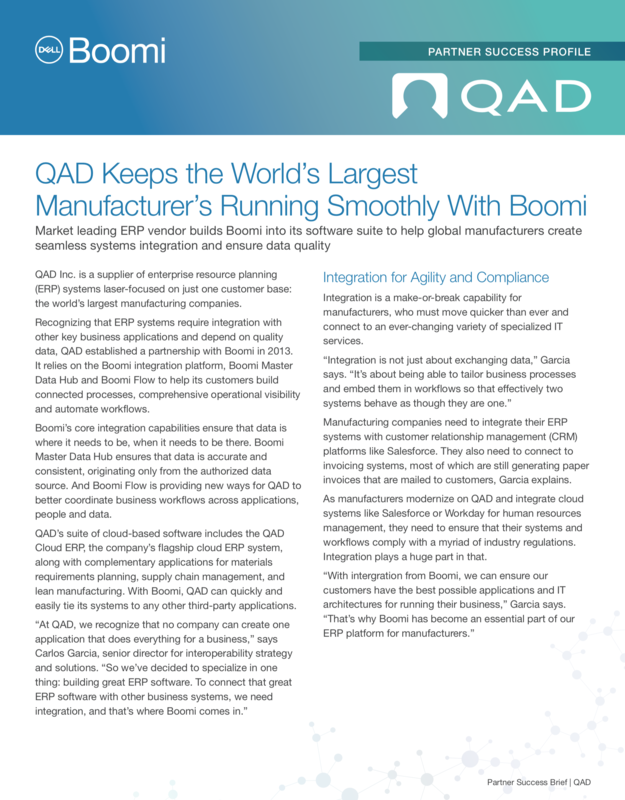 The partnership with Dell Boomi offers QAD customer’s integration services utilizing Boomi AtomSphere®, the industry’s first and leading integration platform-as-a-service (iPaaS), to connect QAD Enterprise Applications to their on premise and cloud systems.